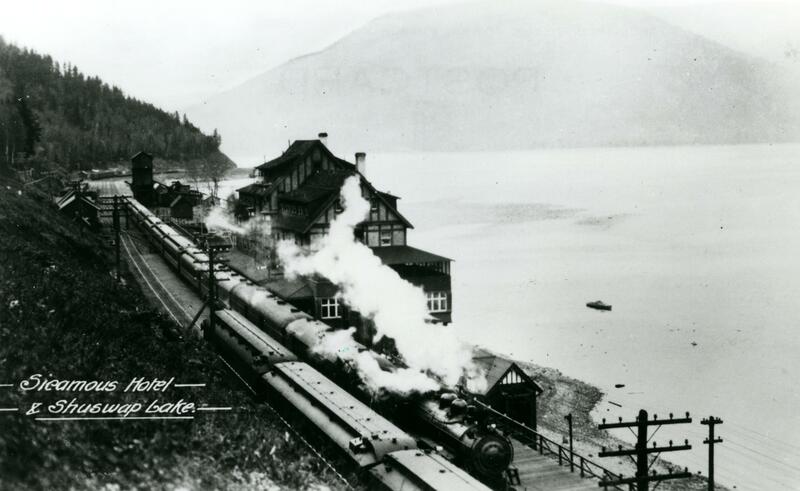 This two-part series features some of the earliest Canadian Pacific Railway (CPR) hotels in British Columbia. Many of these hotels have since closed down but formed an important part of early Canadian railway history. You can view Part 1 here. 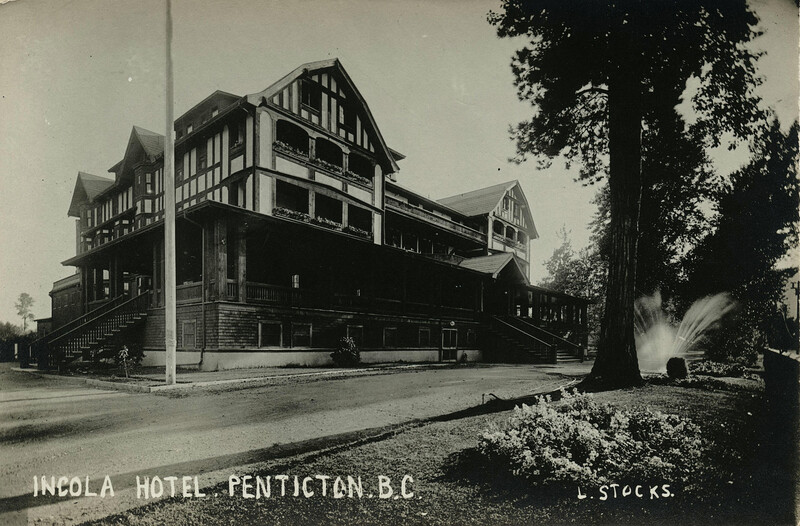 In previous blog posts, we profiled the two largest surviving CPR hotels in B.C. : Hotel Vancouver and the Empress Hotel. 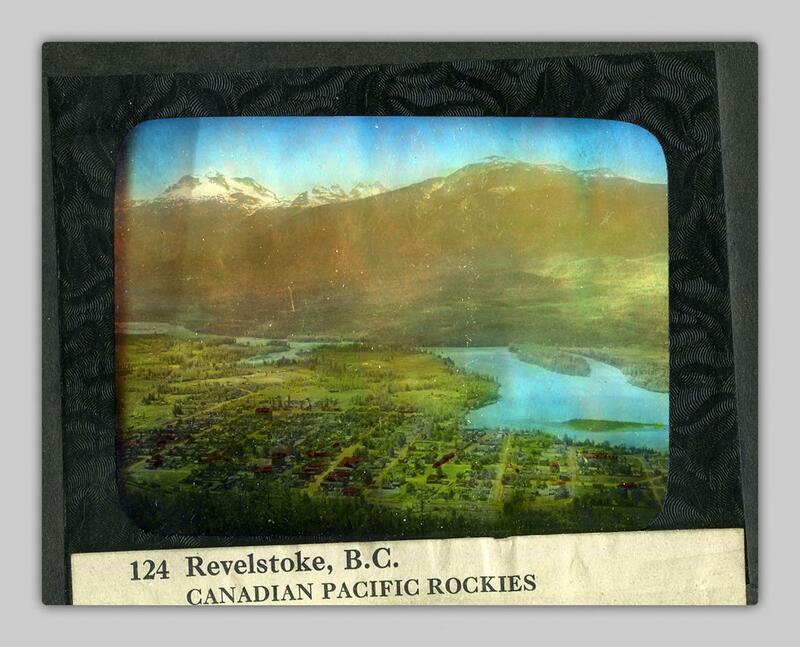 Located in central B.C., Hotel Revelstoke and Hotel Sicamous were popular stops for hunting and fishing. Hotel Revelstoke opened in 1897 in Revelstoke. 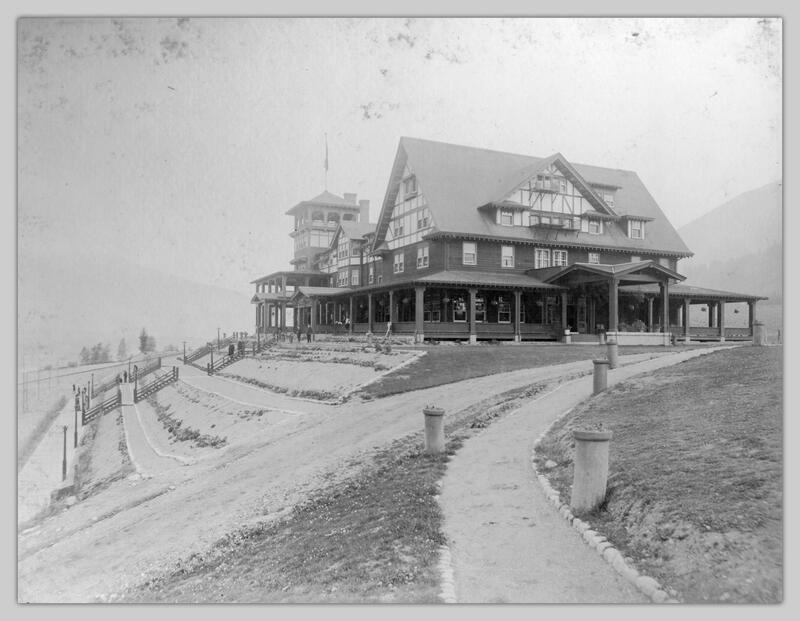 Just a few years later, Hotel Sicamous opened in 1900 in nearby Sicamous, overlooking Shuswap Lake. 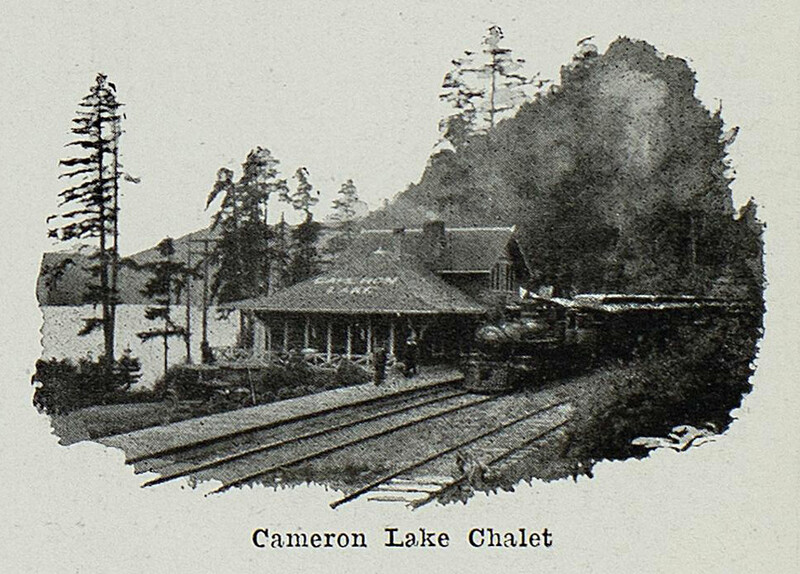 Across Canada by Canadian Pacific Railway, 1913, p. 81. Revelstoke, B.C., [between 1930 and 1939?]. 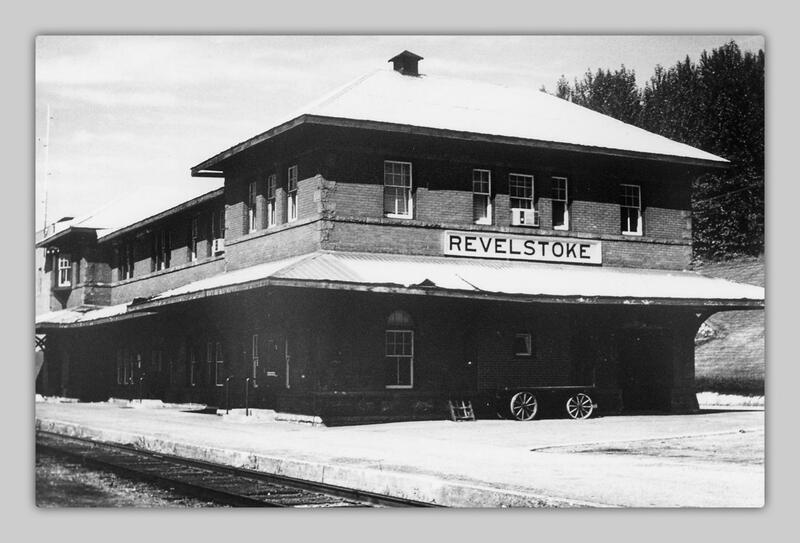 [Revelstoke C.P.R. railroad station], [1975?]. Depot & C.P.R. Hotel, Sicamous, B.C., [between 1920 and 1935?]. 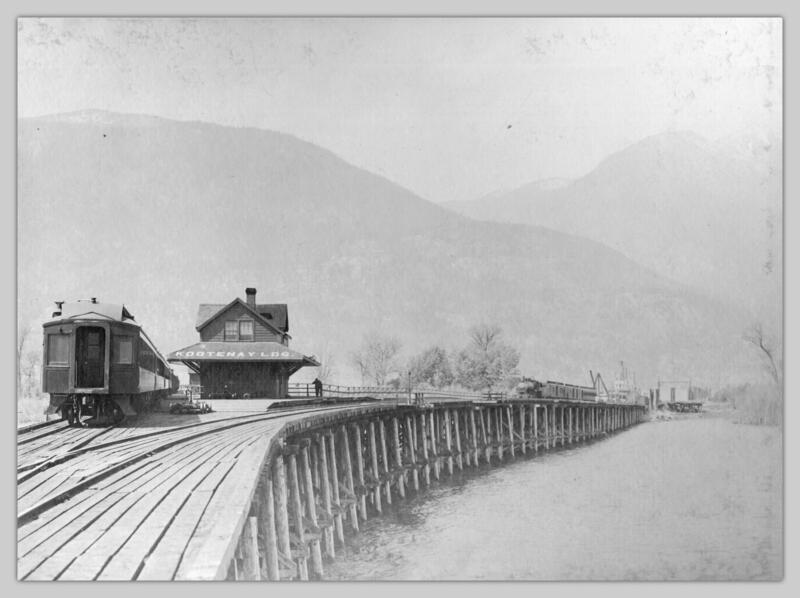 Photo from A series of views illustrating points of interest between Golden and Ashcroft, B.C., including Revelstoke, Kamloops, and Nicola, [1900?]. Meeres, George. A. 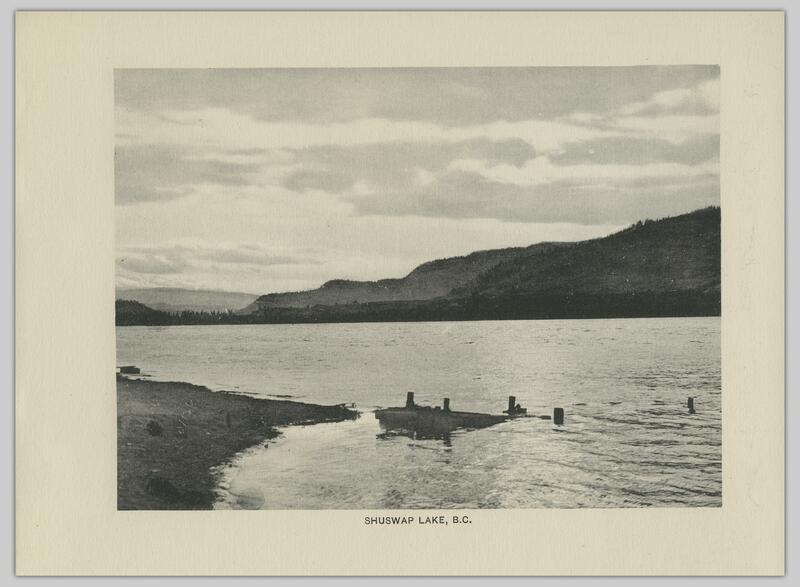 [Sicamous Hotel & Shuswap Lake], [between 1940 and 1949?]. Through the 1930s and 1940s, CPR hotels leased Sicamous Hotel to another operator. The building was destroyed in 1964. Hotel Revelstoke closed earlier, in 1928. 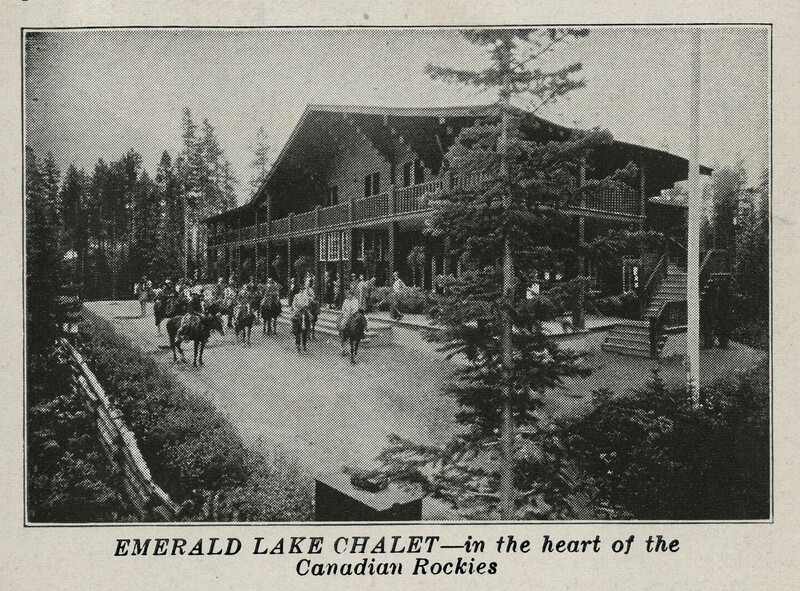 Located by Emerald Lake near Field, B.C., the Emerald Lake Chalet opened in 1902. According to brochures in the Chung Collection, the hotel only operated during the summer months. Suggestions for your summer vacation to and through the Canadian Rockies, 1937, p. 2. 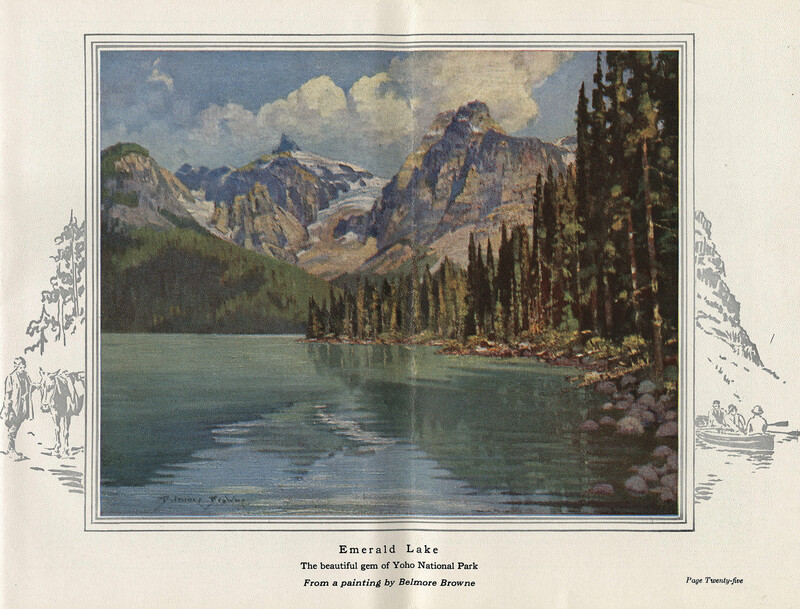 Resorts in the Canadian Rockies, 1929, p. 26. 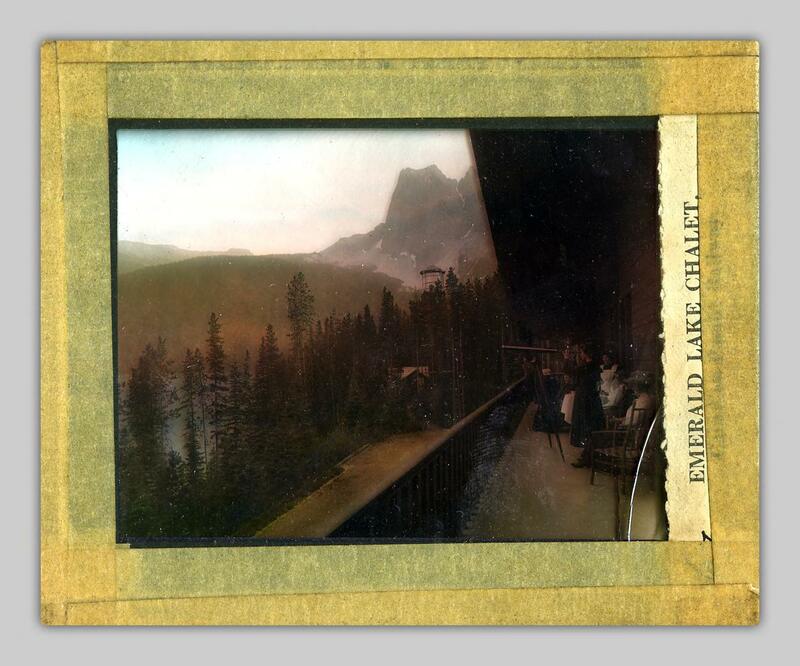 Emerald Lake Chalet : Canadian Pacific Railway, 1900. 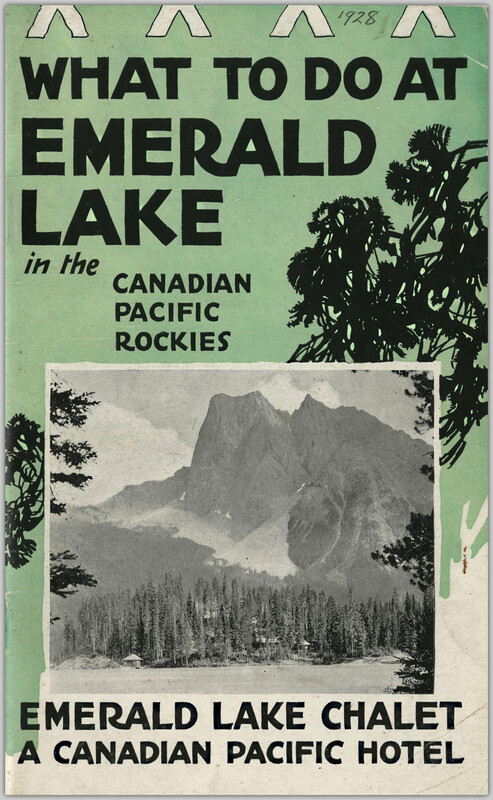 What to do at Emerald Lake in the Canadian Pacific Rockies, 1928. Emerald Lake Chalet in the Canadian Rockies, [not before 1950]. 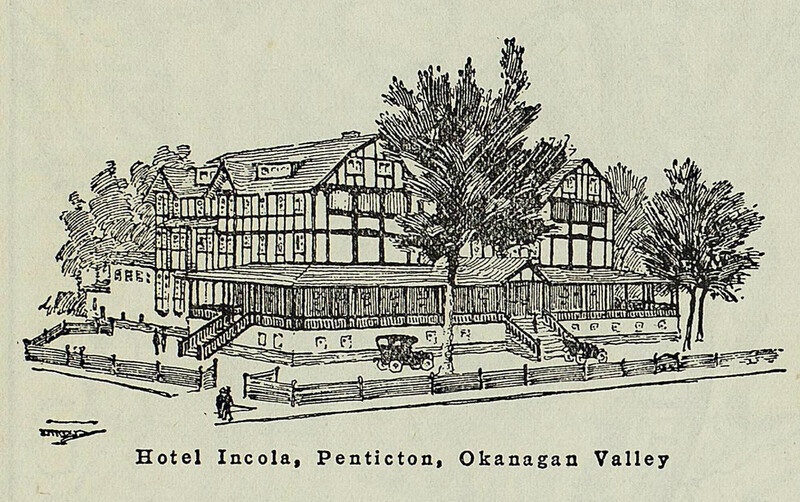 Hotel Incola – Penticton, B.C. : A new first-class tourist hotel at the foot of navigation on Okanagan Lake reached by the C.P.R. Steamers. An ideal resort for any time of the year, owing to the sunny, dry climate of the Okanagan Valley. Rates, $3.00 per day and upward. American plan. Managed by H. Vince, for the Kettle Valley Railway. – Great Britain to Canada and the United States also Japan, China, the far east and Australasia, 1913, p. 6. 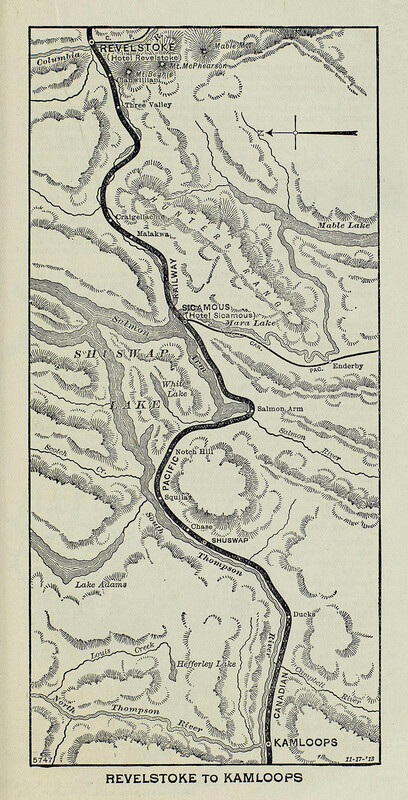 Across Canada by Canadian Pacific Railway, 1913, p. 85. Resorts in the Canadian Rockies, [between 1910 and 1919? ], p. 23. Stocks, Lumb. 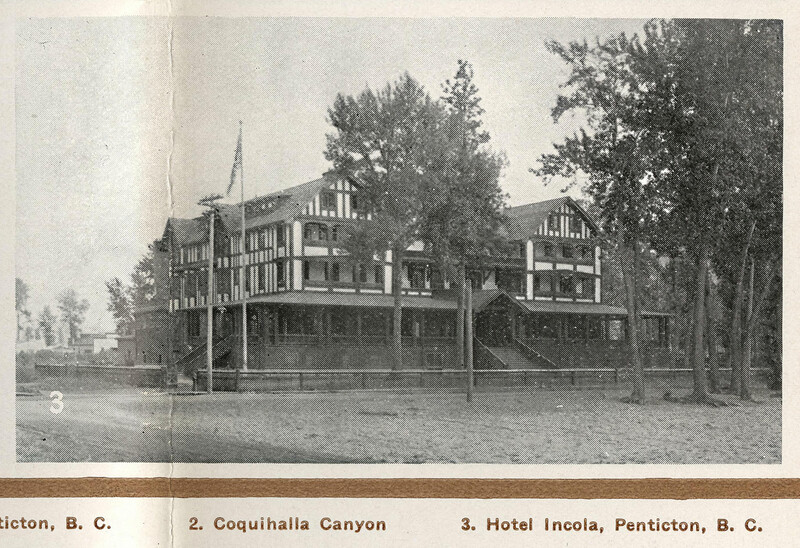 Incola Hotel, Penticton, B.C., [between 1912 and 1935?]. The Incola Hotel closed in 1979, and the building was demolished in 1981. For more details on this hotel, check out Elizabeth Pryce’s 1999 essay, which is available through our Okanagan Historical Society Reports collection. The Kootenay Lake Hotel in Balfour, B.C. was only open for a short time. After opening in 1911, it closed during World War I, then reopened in 1917 as a “sanatorium for convalescing soldiers.” The building was eventually destroyed in 1929. This, the most modern of the Canadian Pacific mountain hotels, is situated to the south of the Main Line at the end of the Crow’s Nest branch. It is essentially a hotel where the tourist can profitably spend a real holiday. Situated amongst scenery, not so rugged as that of the Rockies in the north, but which has a softer fascination, all its own, it stands high on the shores of a lake and among mountains, which have been favorably compared with the Italian Alps. The climate, too, is that of the Italian lakes—deliciously warm in the daytime and cool at night. But it is as a fishing, hunting and boating resort, that the Kootenay Lake Hotel has its greatest claim to favor. The lake abounds in rainbow trout and salmon, for the capture of which every facility in the way of boats, guides and equipment, is offered by the hotel. The wooded sides of the mountain in the near vicinity, contain bear, caribou, white-tail deer, partridges, etc., all of which can be successfully hunted in their proper season. There are good trails for many miles over the mountains, and a wagon road of twenty-one miles has just been completed to the town of Nelson. 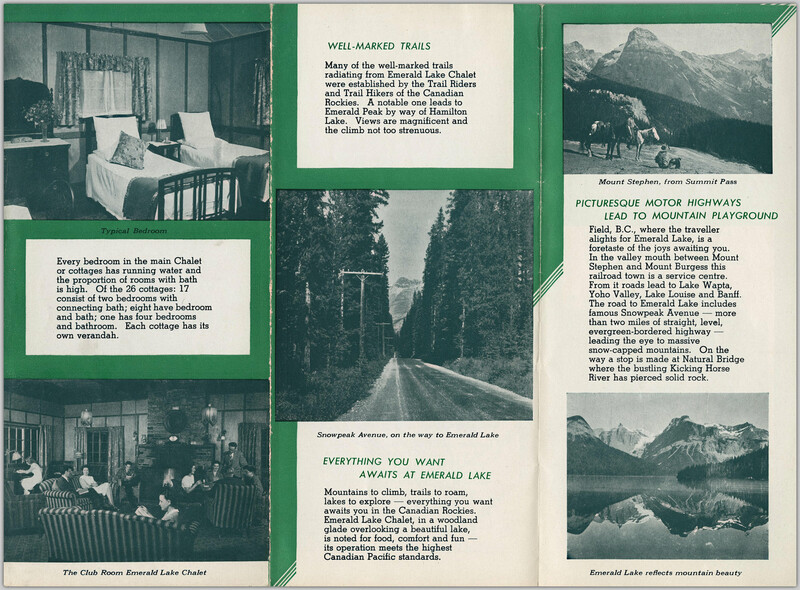 – Resorts in the Canadian Rockies, [between 1910 and 1919? ], p. 19-20. The challenge of the mountains, [between 1910 and 1919? ], p. 43. 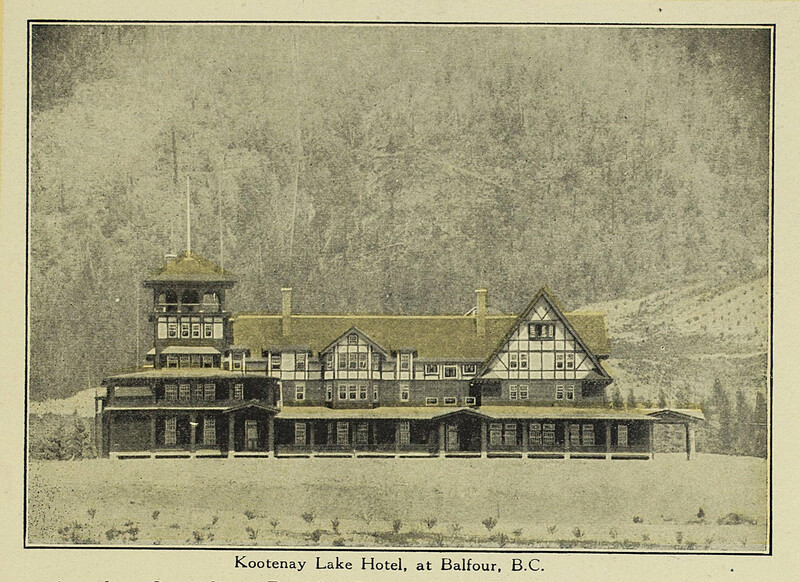 Kootenay Lake Hotel, Balfour, BC, [1910?]. The ten-bedroom Cameron Lake Chalet opened in 1912 by Cameron Lake, B.C., on Vancouver Island. Cameron Lake Chalet—Snugly located at the southern end of the Lake. Excellent fishing at the proper season of the year, and a delightful resort for tourists in limited numbers, Cameron Lake Chalet being owned by the Company, and operated privately. A trail to the timber line of Mount Arrowsmith makes a delightful day or two’s outing for mountain climbers. From Cameron Lake the line skirts the foothills of Mount Arrowsmith (6000 feet high), of which a magnificent view can be had as the train passes along the high cliffs on Cameron Lake. – Across Canada : Western Lines, west bound, 1923, p. 86. Across Canada : Western Lines, west bound, 1923, p. 86. 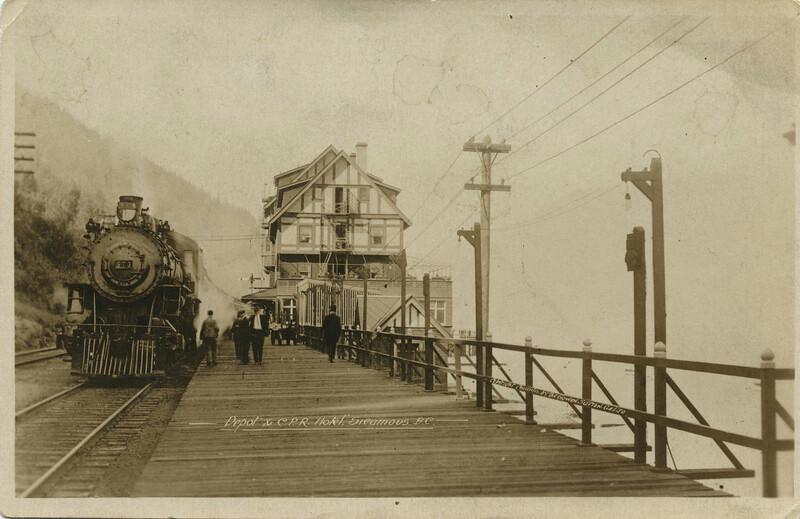 The hotel was open during summers and remained in business until 1966, shortly after the closing of the Port Alberni line passenger service. Bilsland, William Winstanely. “A history of Revelstoke and the Big Bend.” Master’s thesis, University of British Columbia, 1955. Baird, I. (1999, Dec 05). Grand old hotels on island rail lines. Times-Colonist; Victoria, B.C.